On March 28th, Qantas announced it would form a partnership with fledgeling local carrier Oceania Express – to start a behind-the-scenes programme for budding airline executives – after a much-anticipated meeting between the two airline bosses in Sydney. It follows 10-year-old Alex Jacquot’s letter to Qantas Group CEO Alan Joyce asking for advice on how to run an airline he founded during his school holidays. Mr Joyce wrote back to say he would be pleased to discuss further in person – an exchange that has since captured attention globally, including here on Air101. 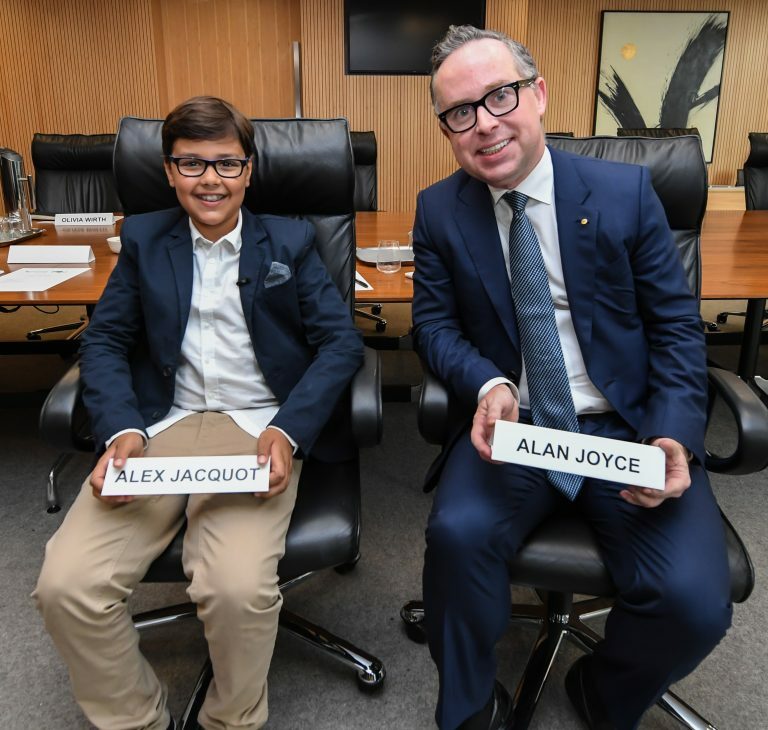 Mr Joyce, who became Qantas Group CEO the same month Alex was born, hosted the meeting at the national carrier’s headquarters. They were joined by Qantas Group executives Olivia Wirth (CEO, Qantas Loyalty) and John Gissing (CEO, QantasLink) plus Oceania Express’s 10-year-old Deputy CEO Wolf Stringer and 7-year-old Head of Inflight Service, Mila Jacquot. Speaking after the meeting, Mr Joyce said: “In his letter, Alex asked me to take him seriously. So we did. It’s hard not to be impressed by his enthusiasm. The aviation industry needs people who think big and Alex has that in spades. It was a pleasure meeting with him and his co-founders. As part of the agreement, Alex was presented with a new logo, business cards and artist impression of the Oceania Express brand on a state-of-the-art Boeing Dreamliner. The domain name oceaniaexpress.com.au has also been registered on Alex’s behalf. Alex and his co-founders also received a tour of the Qantas Integrated Operations Centre, engineering facilities and one of its Airbus A380. At the 30 minute meeting, the six airline executives discussed aircraft types, in-flight catering and the importance of a Frequent Flyer programme. Improving passenger comfort on ultra long-haul flights was a focus, particularly given Qantas’ plans to fly direct from the east coast of Australia to London and New York by 2022. "This is a big day for our little airline," Oceania Express CEO Alex Jacquot said, “We’ve got a lot to learn from them but they can learn from us, too. We’ve got some ideas about how to make long flights less boring. I like the Qantas inflight entertainment for kids but I think we can beat it,” added Mr Jacquot. The ‘Qantas Future High Flyers’ programme will offer a select number of school children the opportunity to experience a day in the life at the Flying Kangaroo in Sydney. The young aviators will meet engineers, pilots and head office staff as well as share their thoughts on how the customer experience can be improved. The programme will be timed with school holidays later in 2019. Children aged from seven to 12 who would like to apply to be part of the behind-the-scenes visit can go to visit Qantas Future High Flyers and write in 50 words or less why they’d like to spend the day at Qantas.